The aging population and the “green movement” are two mega-trends for 21st-century driving demand for aging in place and green home design. Combining these strategies makes good sense for a home which is easy to live in, healthy for the occupants, saves money and supports the environment for future generations. Starting with the site selection of the lot, house orientation and design should take advantage of natural light to cut down on lighting requirements; and reduce heat gain in the summer and loss in the winter. Construction/remodeling of the home should include renewable materials such as; rapidly-renewable wood species like bamboo, recycled-content materials in carpets, tiles, and concrete mixes. The green home will have energy-efficient appliances, windows, and water heating systems with ENERGY STAR® ratings. Other strategies include efficient bulbs and lighting features. Renewable energy sources like photovoltaic electricity and water heating systems will help decrease the overall energy consumption within the home. Here the emphasis is on conserving water by replacing old faucets, shower heads, and toilets with low-flow fixtures. Green appliances include ENERGY STAR dishwashers and washing machines. Tank-less water heaters save not only space, and energy for heating, but also wasted water. Another strategy is buying programmed-water saving low-volume irrigation systems, rainwater collection systems, wastewater treatment systems, and hot water recirculation systems. Also, natural yards with less grassed areas and multiple trees can be lower in maintenance and require less watering. I’m putting in a yard at our new house and I am not using grass at all. Okay, the ornamental grass here and there, but no turf. I’ll have a small drip irrigation system to keep things green during our hot Texas summers, but no sprays–and I make my living repairing sprinkler systems. I believe we are headed toward a water crisis and I want to be a part of the solution. I’m going to catch all the water I can, too. 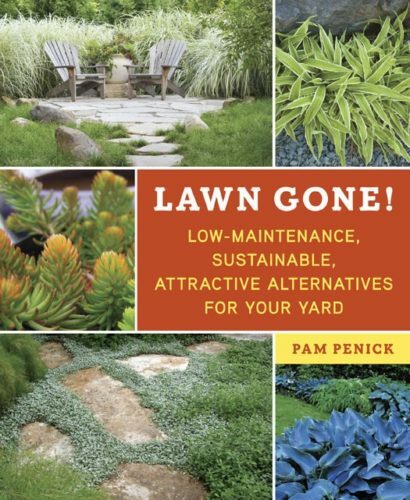 Excellent book if you’re wanting to say “good-bye” to your turf lawn. Heating, air conditioning and ventilation system (HVAC) should be sized for an efficient and properly ventilated home. Bathroom and kitchen fans that cycle fresh air in and stale air out help maintain healthy air quality. Indoor air according to the EPA is considered one of the top 5 hazards to human health; paints and finishes are among the leading culprits. Paints and finishes release low-level toxic emissions into the air for years after application (common in older homes) and the source of these toxins is a variety of volatile organic compounds (VOCs) which, until recently were essential to paint’s performance. The use of new Low-VOC paints, finishes, and wallpapers, is suggested. Green strategies for outside the home include preserving trees and other native vegetation. Landscaping should contain plants that are appropriate for the climate and grouped according to water needs. Solid surfaces such as driveways and other impervious areas should be reduced as much as possible and can be composed of gravel, permeable block pavers, grids, or other permeable systems. 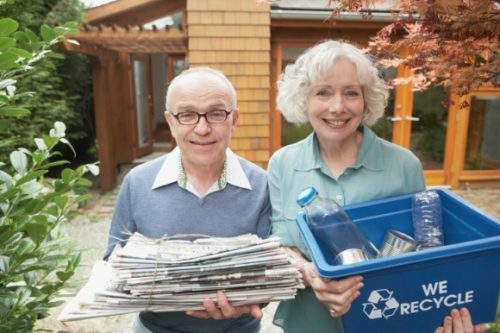 Seniors and boomers are increasingly seeking green strategies for aging in place. They want their wellness to be supported by a home that will conserve resources and reduce the impact on the environment for future generations. During the first part of the 20th century, much of the United States was developed along the lines of European cities with small compact mixed-use neighborhoods. This pattern changed after World-War II with the emergence of modern architecture, cheap gasoline, and the automobile. The American landscape transformed as many moved to the suburbs, shopped at the strip mall, and commuted. The result was “urban-sprawl” as most US citizens now live in the suburbs built in the last 50 years. New urbanism or traditional neighborhood development (TND) is a growing movement based on returning to the traditional neighborhood with town centers, mixed-uses, a housing of different types to accommodate families of varying sizes and circumstances; and options for transportation including walkable communities and transit-oriented environments. What’s TND got to do with green strategies for aging in place? Seniors and boomers report they are planning on aging in place, which for many means the suburbs. Forward-thinking designers and planners are attempting to transform suburbia with smart-growth that includes amenities like pedestrian-friendly neighborhoods that emphasize community and independence from the automobile. Sidewalks built close to porches encourage walking and interacting with neighbors. Markets selling fresh local products are within minutes. And dwellings are built with charm and aesthetically pleasing design to combat “placeless sprawl” and an institutional feeling. New Urbanism can be considered green as older adults choose to form communities less dependent on the automobile, taking transit, shopping at local markets, supporting neighborhood vendors, sharing community services, and preserving countryside and farmland from sprawl.